We use our brains every day. I know that’s probably the most obvious statement ever declared, but in what ways? Sometimes we have to recall certain facts about past events, or remember something that was just said five seconds ago. 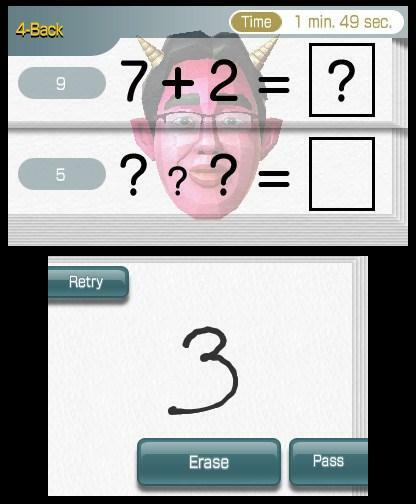 The Brain Age series of games was designed to help people to improve their memory “in just minutes a day” and are inspired Dr. Ryuta Kawashima’s work in neurosciences. Some of the trainings included in the Brain Age games consist of mathematical calculations, stroop tests, and even games such as Sudoku that really make you think. 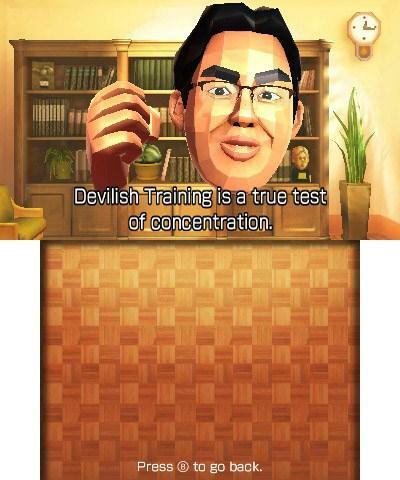 Now, Dr. Kawashima is back once again to train your brain, only this time the training gets a little more tedious. 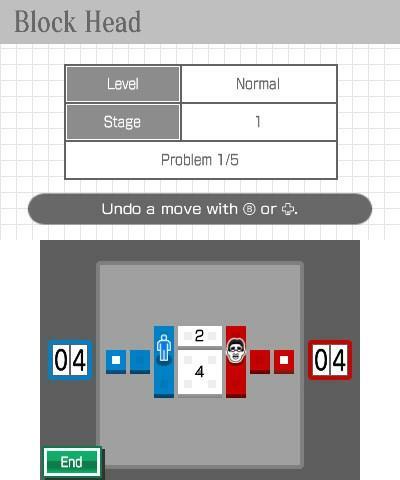 Brain Age: Concentration Training is the third main game released in the series (if you don’t count games like Brain Age Express on DSiWare) and is designed to work on your concentration and working memory. As you’ll learn through the different “seminars” in the game (which are little two-minute speeches you can listen to), working memory refers to the temporary storage of information for manipulation. For instance, when you’re listening to a conversation, working memory lets you understand the overall meaning and make an appropriate response. In Brain Age: Concentration Training, this is done through something called Devilish Training. In Devilish Training exercises, you’re basically shown something on screen, and then have to remember what you just saw for a short period of time. The first exercise (and the exercise in the demo you can download off of the eShop) is called Devilish Calculations. Essentially what happens for the first two levels (1-Back and Fast 1-Back), you’re shown problem one, then you’re shown problem two, but you now have to write the answer to problem one. When problem three is shown, you must answer problem two, and so on. 2-Back and Fast 2-Back are the same, except you must now remember the answers to the previous two problems, so when you see problem three, you have to answer problem one. I know that Devilish Calculations can go pretty high, at least to 7-Back (which I think is just insane), but I’ve never gotten anywhere close, only getting to 4-Back. There are a total of eight Devilish Calculations that can be unlocked by just playing the game at least once a day and after about ten days or so of playing, you should have them all unlocked. The others all work about the same way, just in different forms. For instance, Devilish Pairs (my personal favorite training) is pretty much a game of memory. You get a “correct point” for each pair you turn over, but you get an “incorrect point” if you flip two cards that don’t match and you’ve already flipped at least one of those over. If you get a point ratio of at least 85 percent, you go up a level, 65 percent or less drops you a level, and a score in between keeps you at that level. Other Devilish Trainings include keeping track of mice as they get shuffled around on screen, remembering which shapes you just saw on the top screen (which works similar to Devilish Calculations), and reading sentences, memorizing the underlined word, then, after reading each sentence, you have to write down each underlined word you saw. If any of that seems tedious, fear not, as there are other trainings you can check out, which personally I prefer, but I’ll get into that in a bit. The other types of training include a Concentration Challenge, Supplemental Training, Brain Training, and a Relaxation Mode. The Concentration Challenge works similar to Devilish Calculations at 2-Back, but instead of a math problem; you have to remember how many boxes you saw. This is simply a test to see how far you can go before you get an answer wrong. However, you basically have a few seconds to answer a problem, and if the answer isn’t correct, quickly erase it and try again. Supplemental Training includes things such as the classic Calculations x20, where you have to answer twenty math problems as quickly as possible, Word Attack, where you have to write down words that briefly flash on the top screen, and Sum Total, where you’re give a total, an amount of cash paid, and you have to pick the correct amount of change to give back. Brain Training includes what are probably some of my favorite activities in the game. 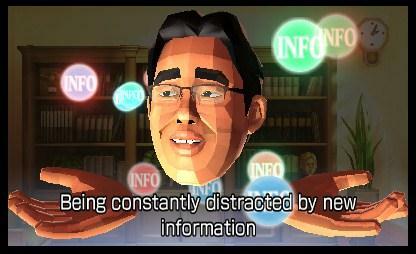 Aside from Spider Solitaire and Klondike, it also includes games like Block Head, where you and Dr. Kawashima move around a board collecting points and the one with the most points wins, and Peg Solitaire, where you’re trying to clear out a board of pegs by hopping over other pegs until only one remains. Finally, Relaxation includes three activities designed to relax your brain. These include a music player, Blob Blast (similar to the classic game Wario’s Woods), and Germ Buster (which is basically Dr. Mario). 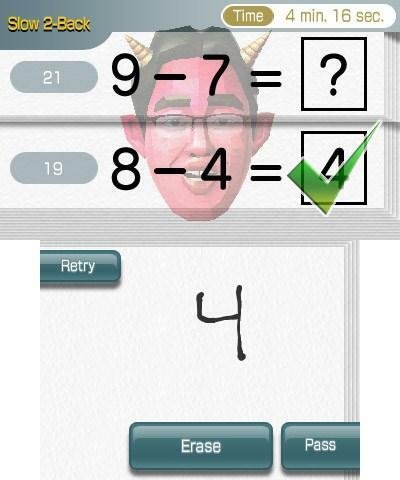 When it comes to the Devilish Calculations, I can probably say that it does help improve your working memory a bit. When I first started Devilish Calculations, I got stuck on 3-Back and kept going back and forth between that and Fast 2-Back. However, a recent run through after not touching it for a while saw me getting up to 4-Back. Trust me, that didn’t last long. One thing I do kind of enjoy is the encouragement that Dr. Kawashima gives you during the trainings. However, with all of the good things I’ve mentioned so far, that doesn’t mean there’s nothing wrong with this game, and there are two things that irk me. Unfortunately, they’re pretty big issues. First off are the Devilish Calculations themselves. Some of them can be fun, such as Devilish Blocks (where you have to remember what blocks flash on the top screen in what order) and the aforementioned Devilish Pairs. Others however can be downright tedious. Devilish Mice was the first one to really frustrate me, as you have to watch mice as they get shuffled around on the top screen, and then remember where they end up. At first it’s not so bad when you only have to watch for two mice, but when you get to four, and they’re constantly entering and exiting the screen, it’s easy to lose track of them. Devilish Shapes has you remembering shapes instead of math problems, but a few of the shapes look similar, and even though it’s multiple choice, it’s still frustrating because if you lose your place for one shape (or for any of the Devilish Calculation trainings), it’s incredibly hard to get back on track. The other really big issue for me is when you have to write answers on the touch pad. For the most part, this isn’t too bad, but sometimes the game just won’t recognize something you write…even if it’s clear as day. I’ve constantly had the number 4 be mistaken for a 1. Granted my handwriting’s not the best, but I can clearly tell what’s supposed to be a 4. It’s the same with words. For some reason, the game has a tough time seeing that “b” is a b, and it’s often faster writing in lower-case letters. However, when it comes to “b”s, I have to use an upper-base B to make sure the game recognizes it, especially in games that are time-based. That’s really all there is to it. The only other things to note are awards and Street Pass. Awards are unlocked as you perform various tasks, such as train for so many days in a row, get so far on a Devilish Training, or even for Street Pass functions (as a warning, when you get the option at the very start to write your own Street Pass message, do it, as it unlocks an award and I can’t figure out how to change your message, so if you miss this award, you might never have the chance to get it again). Unfortunately, I can’t comment on the Street Pass functions as I didn’t get the chance to use them. Overall though, I can say that I did mostly enjoy my time with Brain Age: Concentration Training. Unfortunately, I can see how some people would be a bit put off with the game as it can be quite tedious and frustrating, even getting to the point that you might only be doing some trainings just to unlock awards (and I have no clue if anything happens when you unlock them all). However, some of the info is pretty good, and quite a few of the other trainings in the game are really fun, though I wish a few others were included instead of some of the ones that were. If you’ve enjoyed the other Brain Age games, you’ll probably enjoy this one, but as tedious as Devilish Training can be, you might want to hit up the demo first. While I did enjoy Brain Age: Concentration Training and still train every day with it, there are some aspects I didn’t enjoy. Some of the Devilish Trainings can be just downright tedious and off-putting at times while the game’s handwriting recognition could use a bit of work. However, if you can train enough days to unlock some of the other types of training, it can still be a fun experience.